A prerequisite for cross-country schooling is the rider’s ability to competently ride a galloping horse and be capable of jumping fences at speed. The aim of the cross-country event is to test the stamina, courage and ability of both you and your horse over a course that covers the open countryside, fields and woods. Obstacles are based on what might be found naturally when out riding in open territory, such as ditches, stone walls, fallen logs and water combinations. The important difference between show-jumping and cross-country fences is that cross-country fences are solid and will not fall down if struck by the horse. With this in mind, you should tackle the fences boldly, transferring as much of that enthusiasm to the horse as possible so that it clears each obstacle with confidence while looking forward to the next. In a competition environment, you must complete the course, which could be between 1 and 5 miles (1.5-8 km) long, within a given time limit. You will earn penalties if you ride the course too fast or too slow. Horses thoroughly enjoy riding across country in this manner but they must not be encouraged to gallop into fences. The real aim is to establish a strong rhythm for the duration of the course and yet have the ability to speed up or slow down according to the terrain. To achieve the right canter, both you and your horse must trust each other and be extremely fit and strong. You must have plenty of core body strength, including well-muscled legs, in order to sit up and balance on your horse’s back in jumping position for much of the ride. 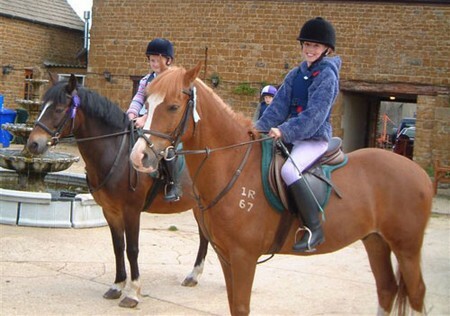 Cantering in the usual manner of sitting on the saddle would eventually tire the horse and possibly bruise its back. Confidence should be built by tackling familiar obstacles, such as low walls, hedges and shallow water combinations, before jumping a combination of two, three or more fences together to create that rhythm. Eventually you will have the confidence to jump quite a number of fences at once and to take them at a greater speed. On the competition day, plan for enough time to walk the whole course before you ride. Pay close attention to the layout of each fence, especially where there are combinations. As well as memorizing the whole course, this will allow you to make quick decisions in the approach to fences to ensure you both clear them safely.